The central nervous system (CNS), working in tandem with the peripheral nervous system, allow the body to control and react to stimuli. In this article, we will look at the function, structure and clinical conditions associated with the central nervous system. The CNS controls our body’s voluntary (e.g. walking) and involuntary (e.g. breathing) functions. The brain is responsible for generating our thoughts as well as interpreting information from the PNS and responding appropriately. This process is made possible by tracts of nerve cells in the Spinal Cord which connect the brain to the PNS. The tracts each have a different function and can be broadly split into Ascending and Descending. The Ascending tracts are responsible for relaying sensory information from the PNS to the brain whereas the Descending tracts send motor signals from the brain to lower motor neurones (which then go on to synapse with muscles to produce movement). The CNS is highly specialised and allows for several functions to be carried out at once. In order to make this possible, there are several specialised cells present. Neurones (nerve cells) are the main component of the CNS. These are long projections which run in series from our CNS into our Peripheral Nervous System and help to relay information (such as pain, temperature, pressure and stretching) from our organs, muscles, joints and skin back to our brain, and vice versa. Astrocytes meanwhile support the CNS by breaking down harmful substances (such as excess neurotransmitter), helping to store small amounts energy stores, maintaining ionic environment and creating the Blood-Brain-Barrier. Oligodendrocytes produce a protein sheath, called Myelin, which surrounds neurones and helps to speed up the impulses they carry. Additionally, microglia are the immune cells of the brain; they carry out immunosuppressive and phagocytic functions. Fig 1 – The different types of cells in the CNS. 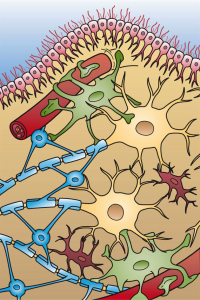 Astrocytes are shown in green, Microglial cells in red and Oligodendrocytes are shown in light blue. 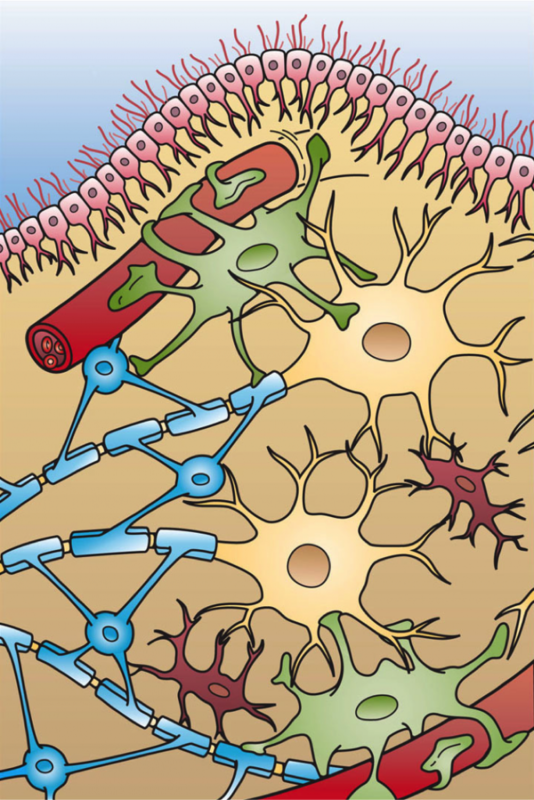 Bacteria and viruses can cause the CNS to become inflamed and subsequently compress the neurones. This can potentially be life threatening as the brain then may not be able to carry out essential functions. Examples include meningitis, which is inflammation and swelling of the meninges surrounding the brain, and encephalitis. Multiple sclerosis is a condition in which the Oligodendrocytes degenerate for an unknown reason. This leads to either sensory or motor symptoms within a patient as the conduction of signals along a neurone slows down. Symptoms involve multiple branches of the nervous system, such as vision problems, weakness, pains, tingling and numbness. 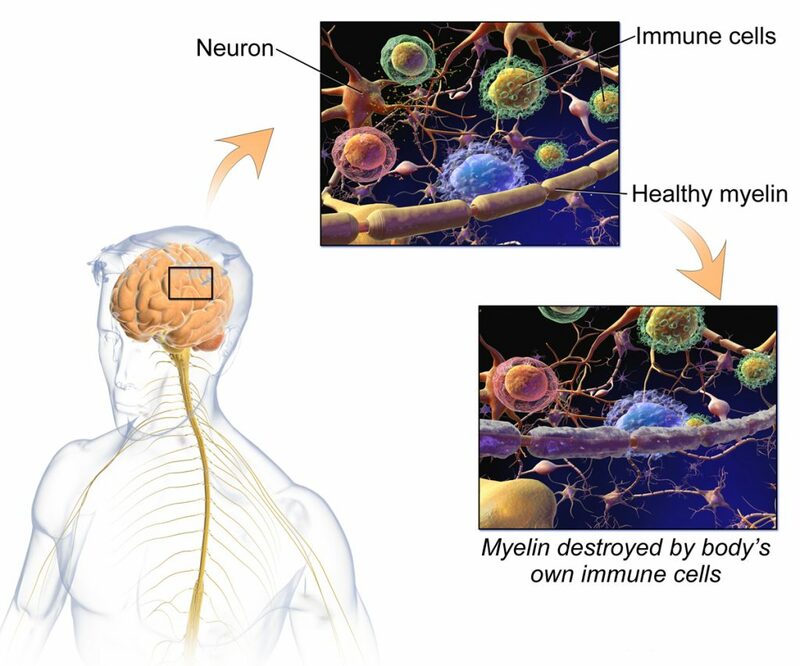 Fig 2 – Multiple Sclerosis and how the degeneration takes place. Alzheimer’s disease is the most common cause of dementia, and is an insidious neurodegenerative disease, the cause of which is still unknown. Mass degeneration occurs, commonly targeting the temporal and parietal lobes which cause a wide range of symptoms. Treatment is focussed on attempting to minimise the impairment, however there is currently no way to halt nor reverse the disease progression. Fig 3 – The level of atrophy that an Alzheimer sufferer undergoes compared to a normal brain.